In order to move forward, I began my search for new gear. After all, I couldn’t be expected to carry all of that heavy, bulky, outdated two-person gear around any longer, now could I? Of course not! Now, I’m a bit of a gear-junkie, and even though I still use an ancient external-frame backpack that I got as a teenager back in 1972, it doesn’t mean that I don’t love the latest, coolest gear! So I searched online for the best and lightest equipment that still suited my purposes. Specifically, I wanted a one-man tent, a light but warm goose down sleeping bag, and a new stove. For starters. I’d worry about the backpack last, after I knew exactly what gear I intended to stuff it with. Plus, I’m still very fond of my 44 year old pack! When it comes to ultralight gear, there’s always a trade-off between weight and functionality. 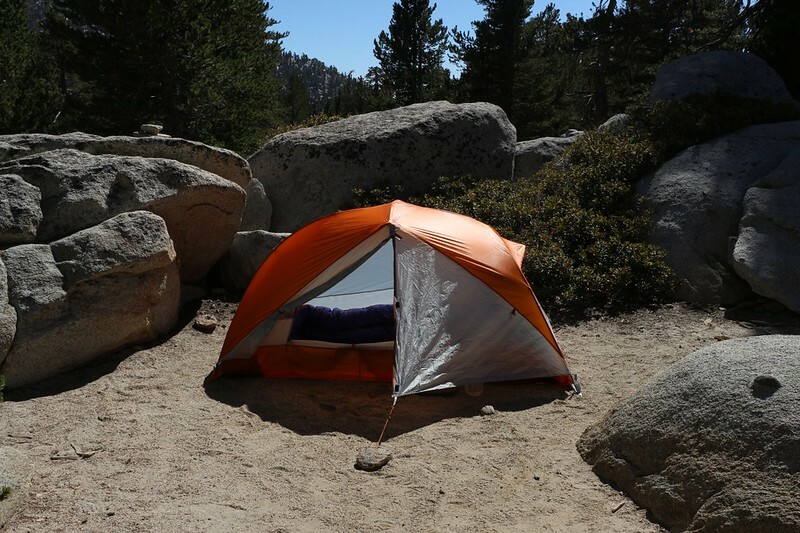 For instance, some of the lightest shelters are little more than a nylon sheet stretched taut over two hiking poles, but they have the bad habit of letting in plenty of wind and bugs. To solve that problem you have to increase the weight and buy a modified tarp with screening and floor, but it still won’t stand up on its own. To get a free-standing tent, the weight goes up once again. In the end, I decided that comfort “outweighed” bugs and wind, and I chose a tent that weighed a bit less than three pounds. The same with the sleeping bag: I knew that I was a “cold” sleeper, so I chose a slightly heavier bag that provided extra warmth. Researching stoves was even worse, because there were so many styles and fuels and pots to choose from. 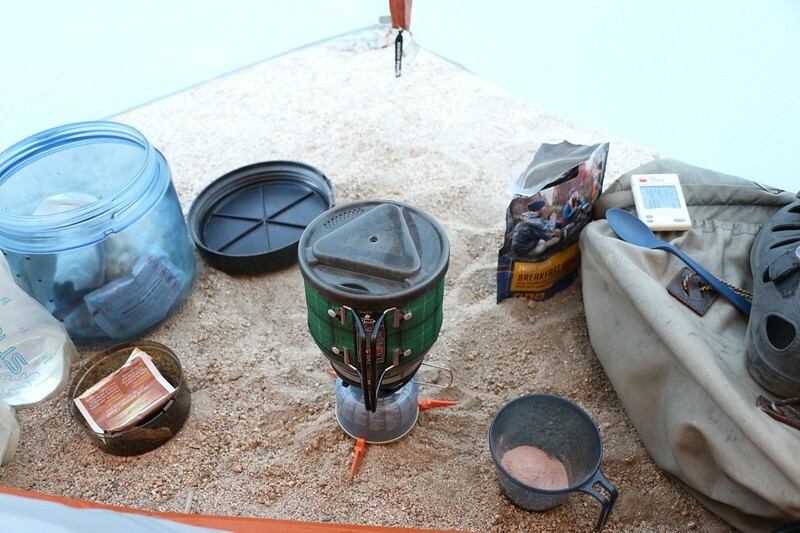 In the end I went with a stove/pot combo system that packed down small and didn’t weigh too much. I was burnt out from reading gear reviews by then, so I may have chosen my stove hastily, but at that point I really didn’t care. I also decided to schedule two solo backpacking trips in September and October, and sent off for the requisite permits before I’d even begun buying my gear. They arrived a week later and I was good to go. Now all I needed was the gear! 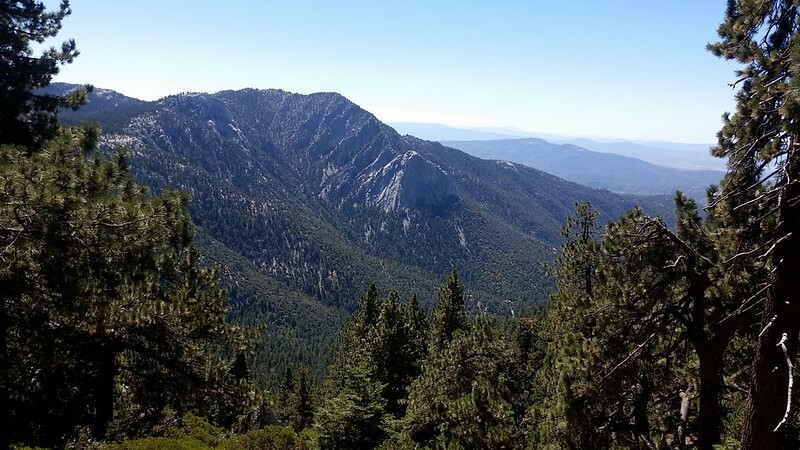 I took advantage of some sales and special-ordered a custom sleeping bag, and two weeks later I was fully prepared for my first solo trip: Hiking to Little Round Valley in the San Jacinto Wilderness. I’d been there before, so the only surprises would be the new gear and being all alone for three days. I decided to get an early start as it was a Friday and I hate L.A. rush-hour traffic. I left my house at 4am and arrived on the two-lane highway at 6am, a bit before dawn. I also timed it so that I would drive the final rough dirt road up to the trailhead while it was light. It was a long road and a slow one. I made it to the trailhead parking lot by 7am, then futzed around with my gear for a while. Now that I was here, there was no rush whatsoever. I could run, walk, or crawl the trail. In fact, I could camp right there if I felt like it. True, I was still all alone, but the freedom was sweet, the opportunities limitless. But that only sounded good. The reality is that I had already promised Vicki that I wouldn’t leave the trail and hike cross-country. Why? Because I had no buddy with me. If something debilitating happened to me out in the middle of nowhere the chance of someone finding me in time to save me was near zero, but if I stayed on a trail it was more of a certainty. So, until I purchased a satellite communications device my options were limited. 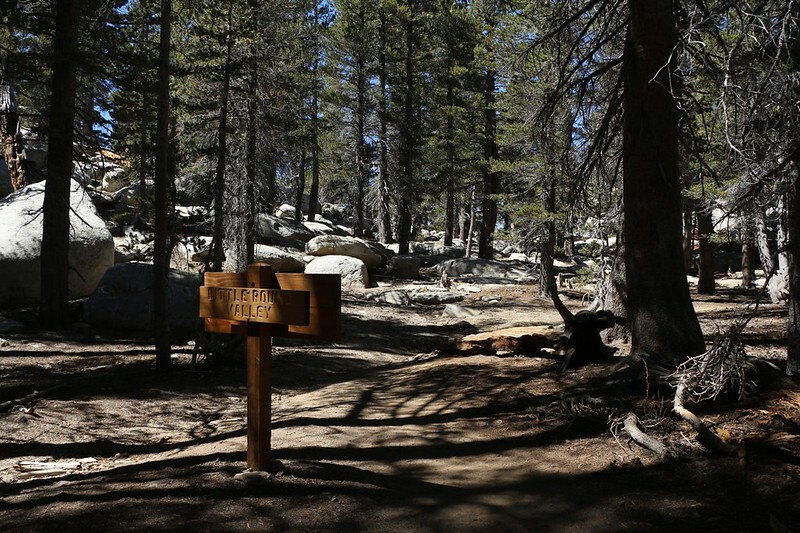 Luckily, the Fuller Ridge Trail was one of the prettiest trails in the San Jacinto Wilderness, so staying on the trail would be a joy. The trail starts high and stays high, and follows the ridgeline for miles, first on one side, then the other. 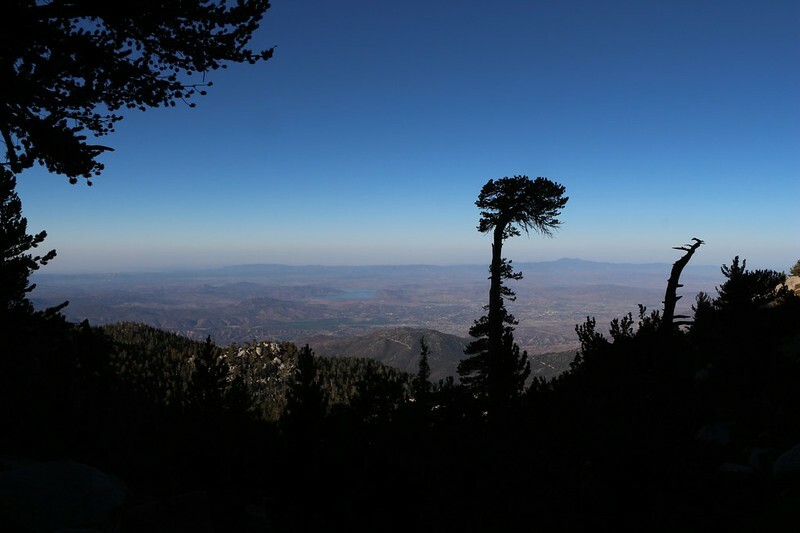 The views were expansive and varied, first looking north and east toward San Gorgonio Mountain and the Coachella Valley, then west toward Idyllwild and the valleys beyond. 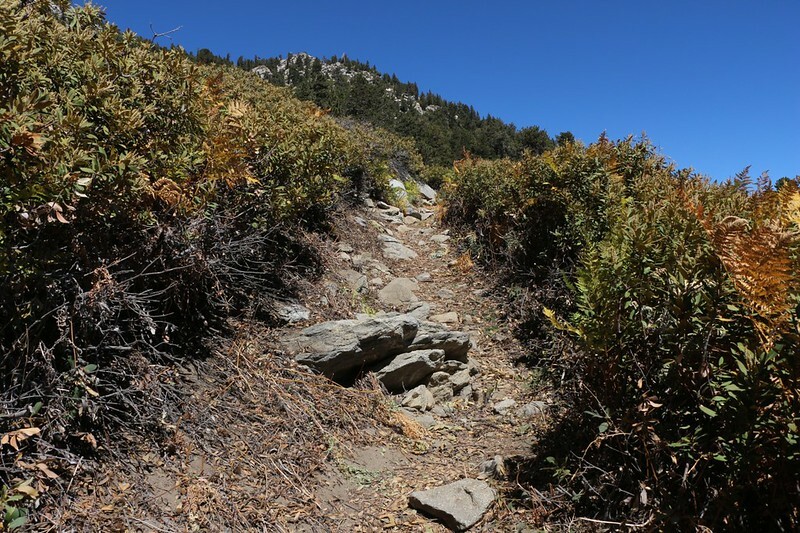 This trail was part of the Pacific Crest Trail (PCT) and as such it followed the crest, meaning that it spent plenty of time going up and down. And up and down. 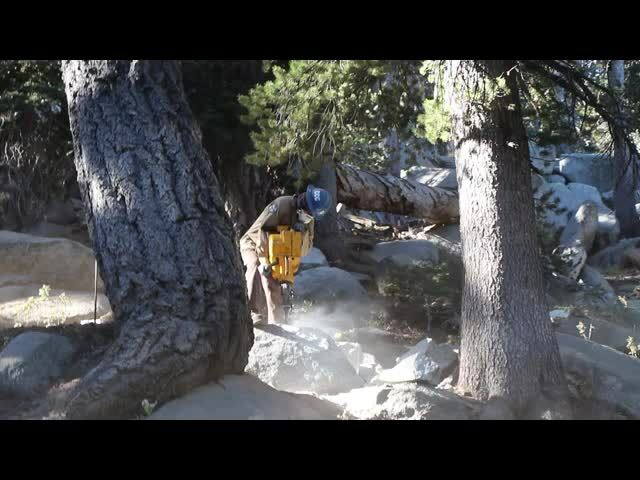 As long as you expect this behavior when you hike the PCT you won’t be angry at the original trail builders, who seem to delight in wasting all of your hard-won elevation gains for no obvious reason. 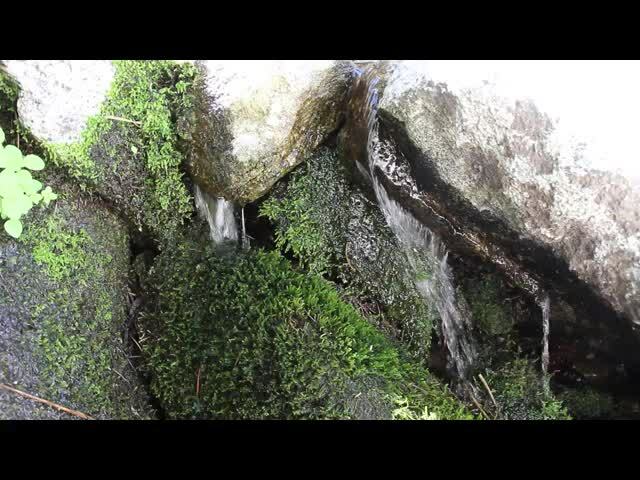 Video of Lower Bed Springs Crossing, one of the few places with water this time of year. 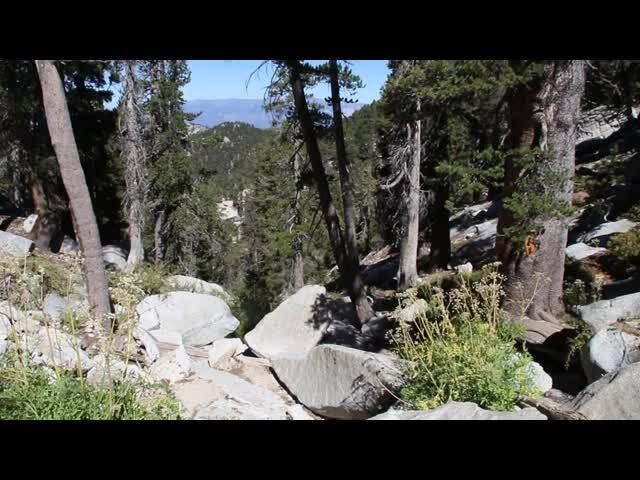 All told, I was on the PCT for about four hours, taking only a couple of short breaks. I could have taken more of them (who would have stopped me?) but I was happy enough simply hiking along. I hadn’t seen a single person all morning, as it was a weekday, and that suited me just fine. This was supposed to be a solo hike, after all. Just the same, I admit that I would have been happier with Vicki along; we always point out items of interest to each other, marveling in the wonders of Biology, Geology, and Viewology. In other words, I probably missed seeing some cool stuff without her around to notice it and bring it to my attention. 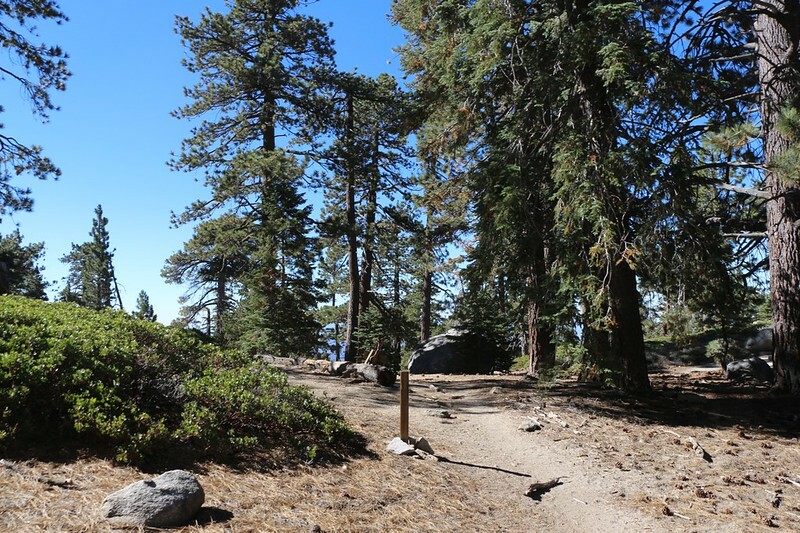 I arrived at the intersection with the Deer Springs Trail, and the PCT joined it and headed downhill to the right. I, on the other hand, turned left and began the arduous climb up to Little Round Valley, where I would be spending the next two nights. The trail was fairly steep, there wasn’t much shade, and it went through an entire hillside full of Buckthorn plants. Emphasis on the thorns. Good thing I was wearing long pants! 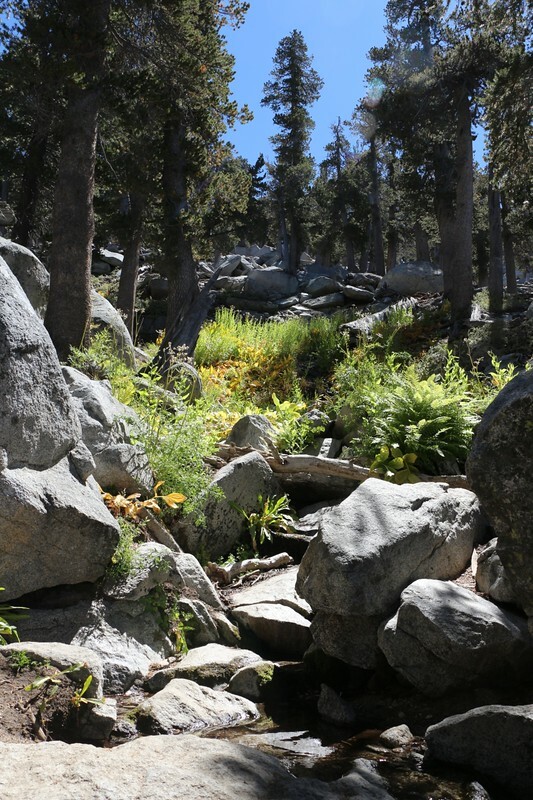 Eventually I arrived at Upper Bed Springs Crossing, my main source of water for the weekend. It was gurgling melodiously and flowing directly across the trail. There were lush plants growing all along the watercourse and the air smelt humid. It was called Bed Springs because somewhere up above me on the mountainside was an old metal bedspring frame near the spring itself, a relic of a time when someone may have had a long-term campsite up there. Whatever the history, the water was very welcome, and I filtered enough to refill my water bladder plus one gallon for meals. I must say that I wasn’t all that happy about adding an extra eight pounds to my pack, but it beat walking the half mile back here to filter some water later on. 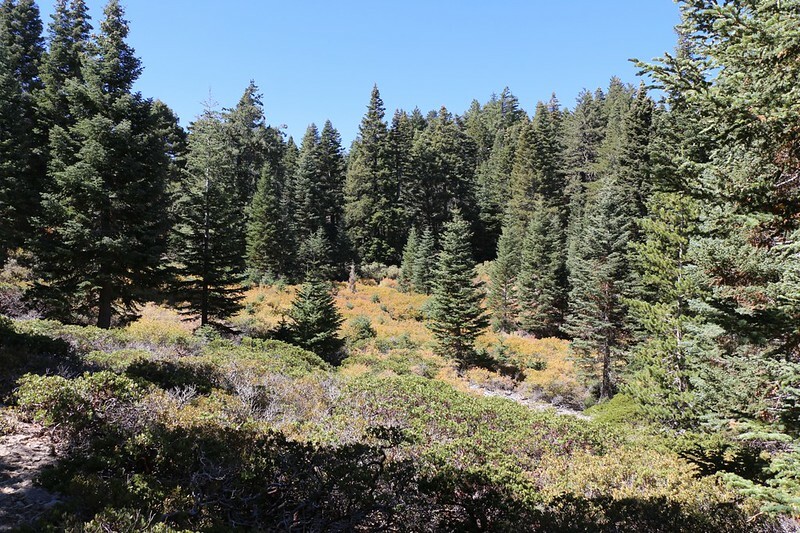 So I shouldered my pack and continued trudging up the trail toward Little Round Valley. The trail got steeper, and there were a number of sections that could have used some trail maintenance, but all in all it wasn’t so bad. I also knew that I’d be stopping soon, and that I could take a nap in my new tent if I felt like it. This idea provided some extra stimulus. And that’s exactly what I did. I made it to camp and I set up the tent. I blew up my air mattress and opened my sleeping bag, allowing it to expand to its fully lofted size. Then I climbed in and arranged my primary gear on the inside and the secondary gear outside in the vestibule. I was able to reach everything I needed without getting out of my sleeping bag. 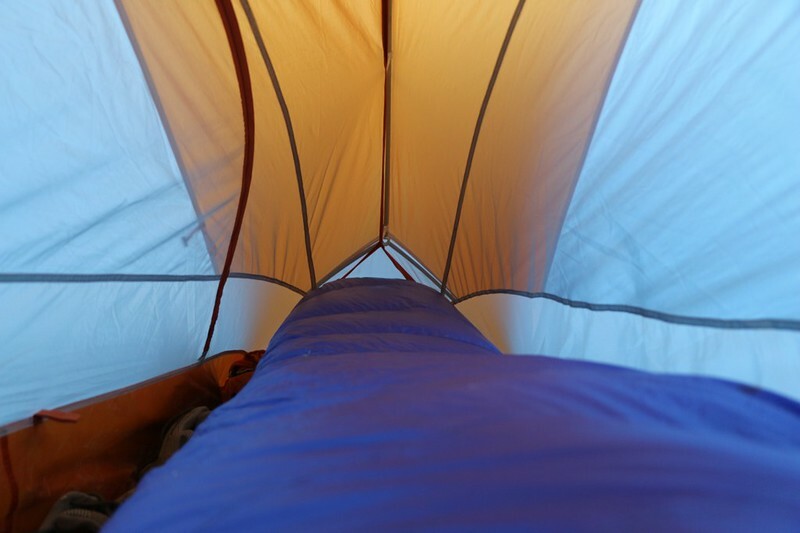 Although the tent was narrow down by my feet, there was plenty of room up near my head for all of my personal items. Then I kicked back and read my book for a while. When my book got too heavy I shut my eyes and napped, dreaming of the trail and the views I’d had. But I didn’t allow myself to nap very long. At this time of year, mid-September, the nights are getting rather long. I usually sleep five or six hours per night, and it would be dark for twelve! I wasn’t really fond of the prospect of lying there all alone for hours, even if I was reading a book. My best bet, I thought, was to wear myself out with so much hiking that I slept the whole night through. But first it was time to get out my new stove, a Jetboil MiniMo. I got it on a 40%-off sale because this version had a green plaid cozy on the pot; I’m guessing this color wasn’t selling so they clearanced it. But the stove underneath was exactly the same! It was a deal, in other words. And it worked just fine. I cooked up my freeze-dried dinner and hot chocolate in no time. The built-in piezo igniter didn’t work worth a darn but I expected that from reading all those reviews. I gave up on it after only a few tries and lit the stove with a lighter. The dinner tasted OK but it wasn’t as much fun as eating it while sharing the same spoon with Vicki. Plus, I had to eat the entire serving, instead of foisting off the last few bites on her the way I usually do. After that, it was getting late, but the sun was still fairly high above the horizon, so I took a walk around Little Round Valley. 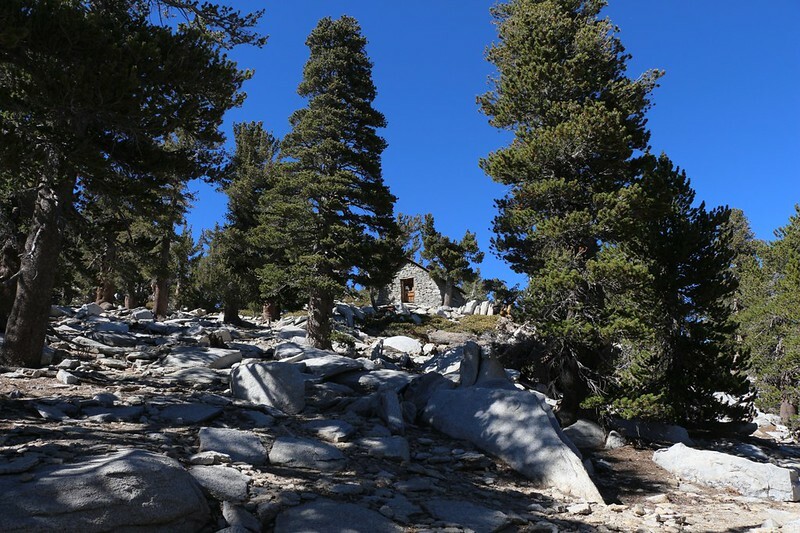 I wandered up toward the peak on the main trail, and climbed nearly halfway up the switchbacks, hoping to get a good view of Marion Mountain and the sunset, but the angle was wrong, so I went back to camp. 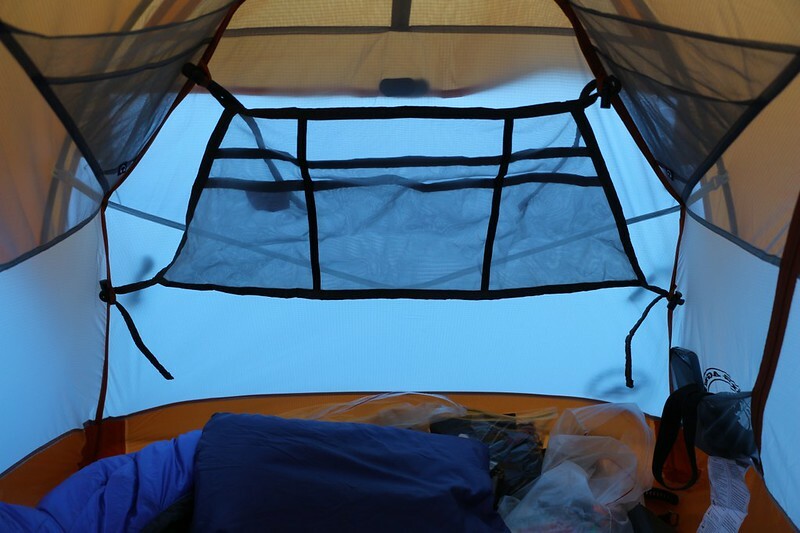 The temperature began to drop and I retired into the tent even though the sun hadn’t set. I hurried, bare skin shivering in the cool evening air as I pulled on some fresh dry clothes. Then I stuck my legs in the sleeping bag. Aaahhh! I knew right away that I was going to be warm that night. Then I got out my book and headlamp, and started reading. That final hike must have worked, because I didn’t stay up very long. While it’s true that I slept the entire night, part of the reason was that I didn’t sleep as soundly as I would have liked. Why? Because the Santa Ana Winds picked up around midnight. There I was, snug and warm in my sleeping bag, when I woke to the sound of high mountain winds. Mainly the winds stayed high above me, swirling and roaring and whistling as they pushed against themselves, but occasionally a gust would reach the ground and visibly shake the tent. It was a full moon, so I put on some extra layers and ventured outside. The temperature was quite cool, down in the mid forties, and I shivered a bit as I wandered around the campsite. The granite boulders were shining white in the moonlight, the bushes dark shadows between them, and the trees were silhouetted against the stars. It was crisp and cold but I had my raingear on and it was proof against the wind. I kept my hands in my pockets as I wandered about. But I didn’t stay out very long. That nice warm sleeping bag kept whispering to me. And somehow those whispers were louder than the wind. So I went back inside and read my book for a while, with my headlamp on and my arm getting cold where it exited the sleeping bag to hold the book. Then I slept again, off and on, waking with the wind gusts and rolling over to face the other way. Later on the moon set and it was dark for an hour or so, but all too soon the dawn began lighting the tent. I tried to ignore it, but eventually it became obvious that ignoring it wasn’t doing a whole lot of good. Day had arrived. I sat up, my legs still in the sleeping bag, and put on my jacket. Time for breakfast! And then I did a thing that Vicki never, ever would have done: I lit the stove in the tent. Well, technically not IN the tent; I lit it in the vestibule area just outside the screened-in section of the tent but under the tarp. I was being a naughty boy, I thought, and I smiled to myself. Naughty beat freezing any day. While the water was heating I got out my digital thermometer and discovered that it was 44.1 degrees out. Not as cold as it felt but it was cold enough to want to stay in my sleeping bag until the sun struck the tent. I drank my hot chocolate and ate my freeze-dried eggs with hash browns in comfort. I was extra careful to lean over into the vestibule and avoid spilling anything on my new gear. Then I prepared for a long day of hiking. My plan was to do a huge loop around the mountain, about twelve miles total with 2700 feet of elevation gain. Vicki and I had done this same hike back in 2011, so I knew what I was in for. 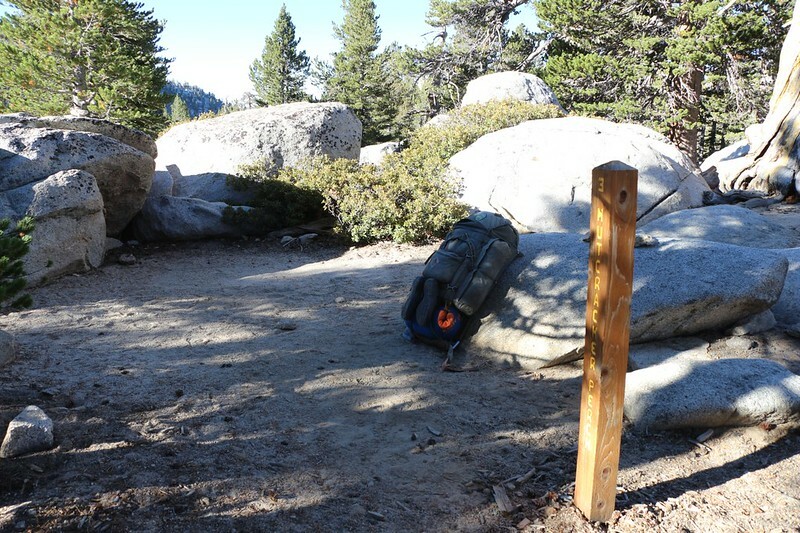 I decided to hike with my big pack, but only carrying the ten essentials, so it wouldn’t be too heavy. 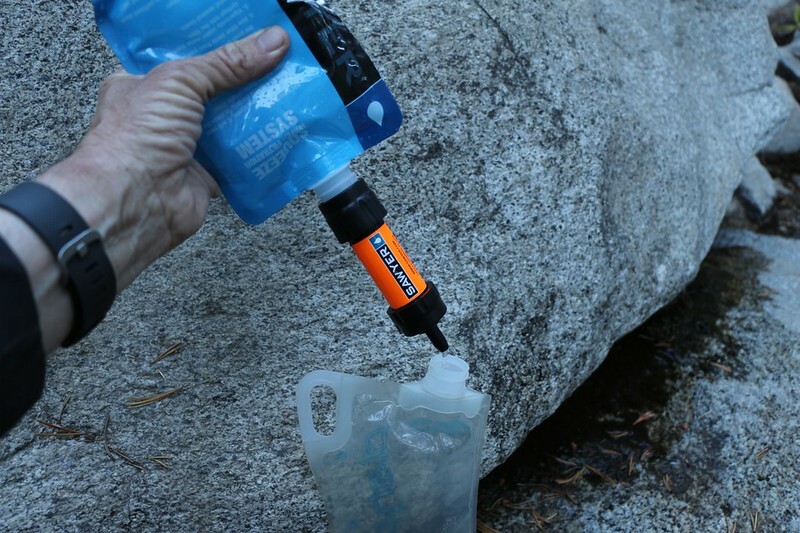 I also wanted to check out another piece of new gear, an ultralight water filter that only cost twenty bucks. So I emptied all of my water bladders into the main gallon container (that I left in camp for dinner and breakfast), and hiked back down the Deer Springs Trail to good old Bed Springs, where I filtered three liters of water. That should be enough for today, I decided, because it wasn’t supposed to be too hot. 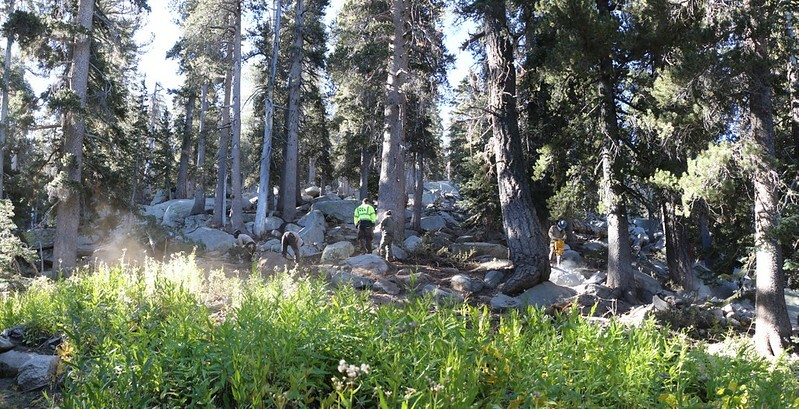 Further down the Deer Springs Trail I discovered a crew from the California Conservation Corps (CCC) doing some trail building. Or trail re-building, as they were re-routing this section of the PCT a bit higher on the hillside. It looked like a tough job, but also a lot of fun and a great experience for someone who’s young and energetic. 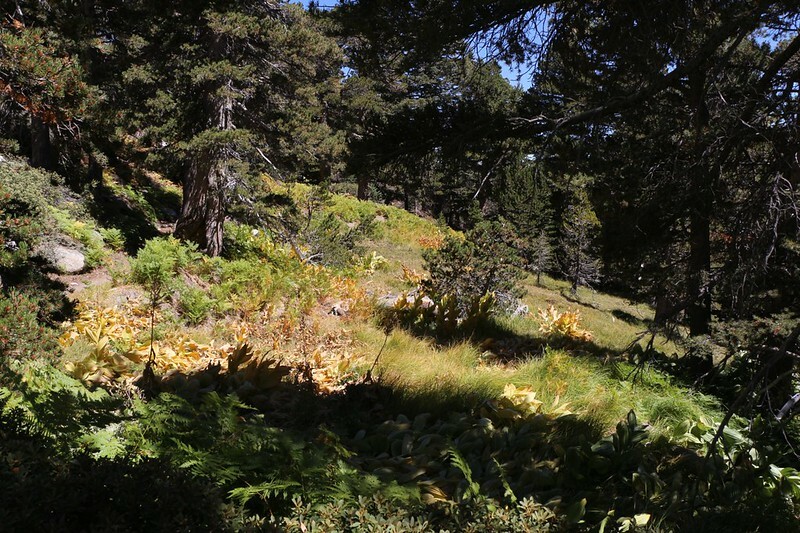 After that, the trail continued downhill through a pleasant pine forest. All told, it descended about 1700 feet and 3.5 miles until Strawberry Junction. This was the lowest point of the day’s hike. This was also the point of no return. 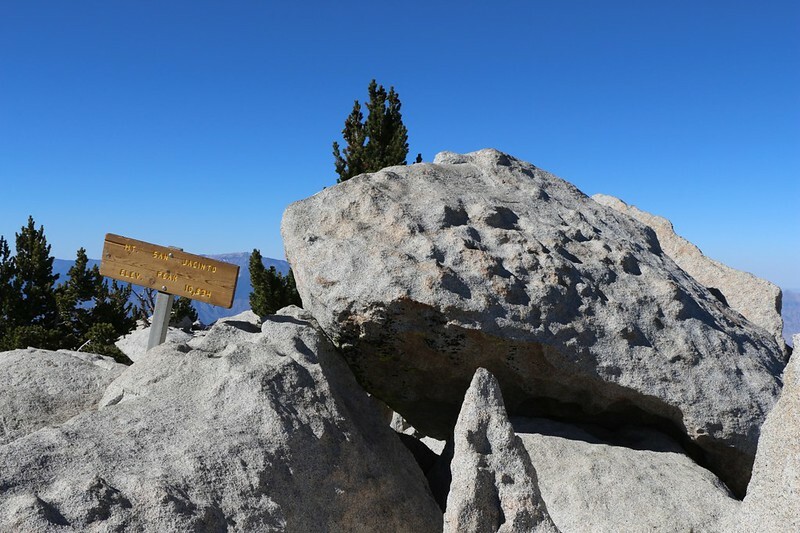 Once I decided to continue onward, I would be committing myself to climb all 2700 feet to the summit of San Jacinto Peak. The other option was to turn around right now. I decided that I was feeling pretty good, so onward I went. And I was glad I did, because the views were absolutely awesome! 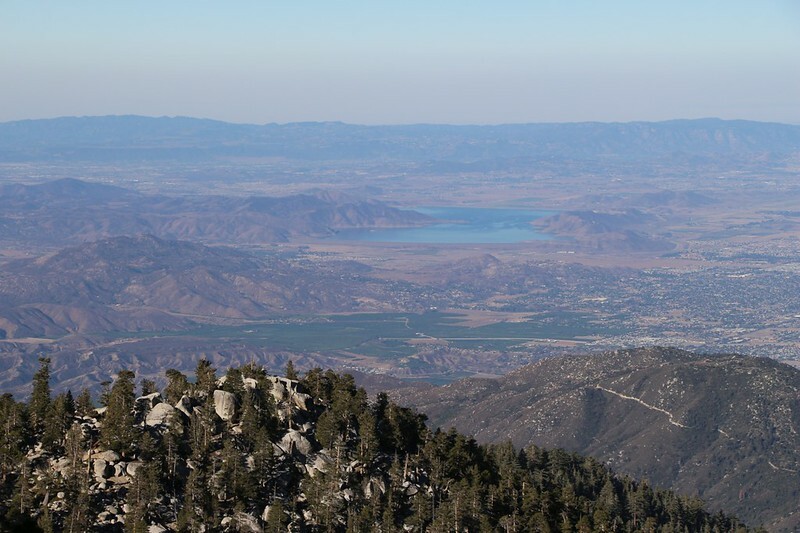 After wandering past Strawberry Cienega, which was dry, I stopped for lunch with the stunning view out over Tahquitz and Idyllwild. I took off my shoes and cooled my hot feet in the breeze. It was a joy to be in a place like this, whether alone or otherwise. It was absolutely beautiful. 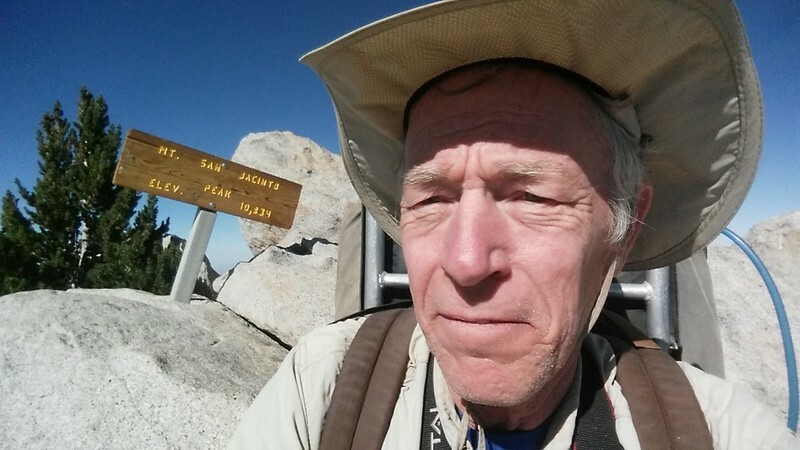 After more climbing in the hot sun, I reached the junction with the Wellman Divide Trail. 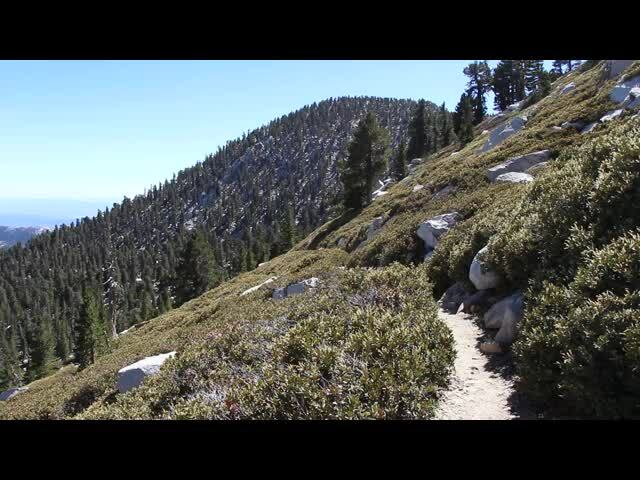 This is where I left the PCT. Goodbye PCT! 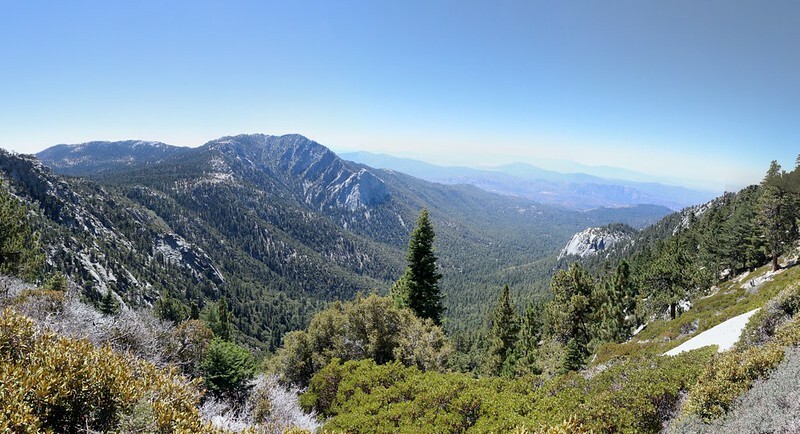 It headed downhill toward Saddle Junction and Idyllwild, whereas I intended to keep turning left in a big counterclockwise loop. A short while later I discovered that there were still some pools of water in lower Wellmans Cienega, but I didn’t need to filter any, so I hiked on. I was happy to see that someone had been doing some trail work along here, knocking back the ever-encroaching chinquapin plants. 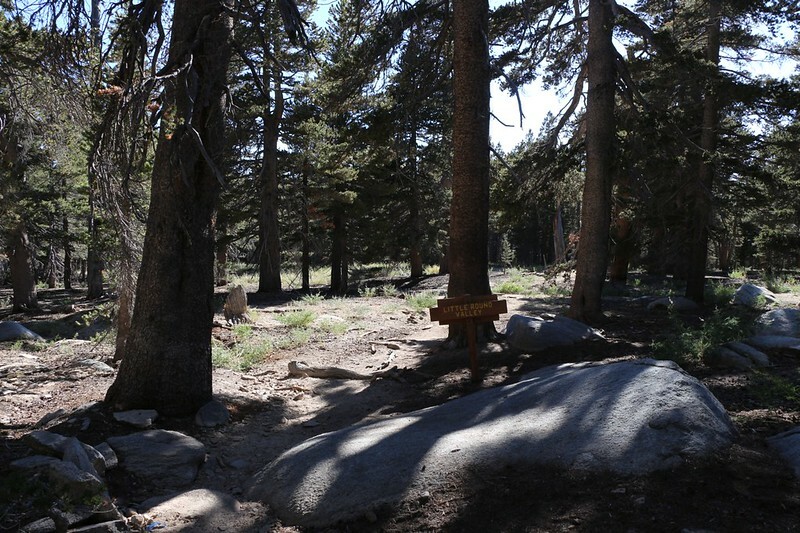 The trail continued its relentless grind uphill in the sun and I slogged on, looking forward to a brief rest at Wellman Divide. The views from the divide were excellent, as usual, but by the time I got there I didn’t want to rest. I wanted to make it to the peak! So I hiked onward. 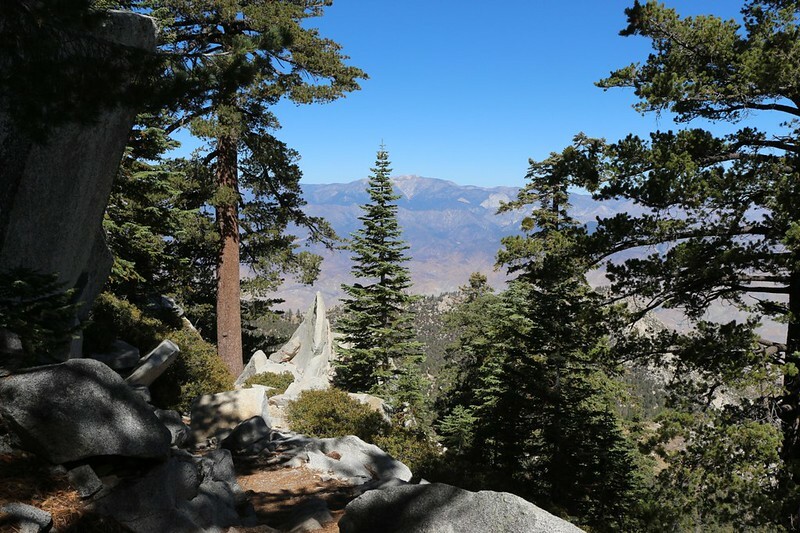 Meanwhile, it turned out that I was in luck, in that the Palm Springs Tram was closed for maintenance, and the trails on this side of the mountain were almost completely deserted. 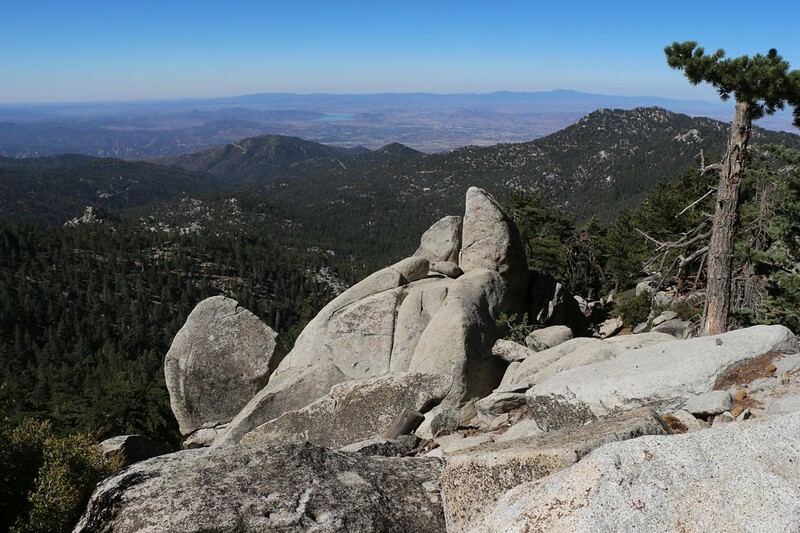 On a typical Saturday, the San Jacinto Peak Trail is like a superhighway full of people. 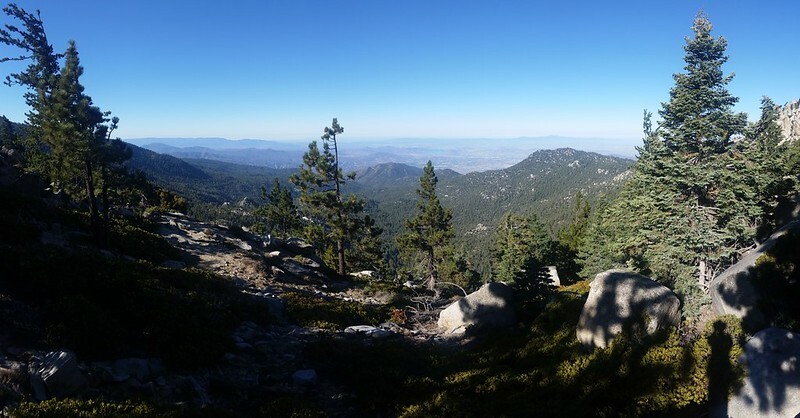 That day I only met five people, all of them heading downhill for Idyllwild, and all of us were happily enjoying the Peace of the Wilderness. 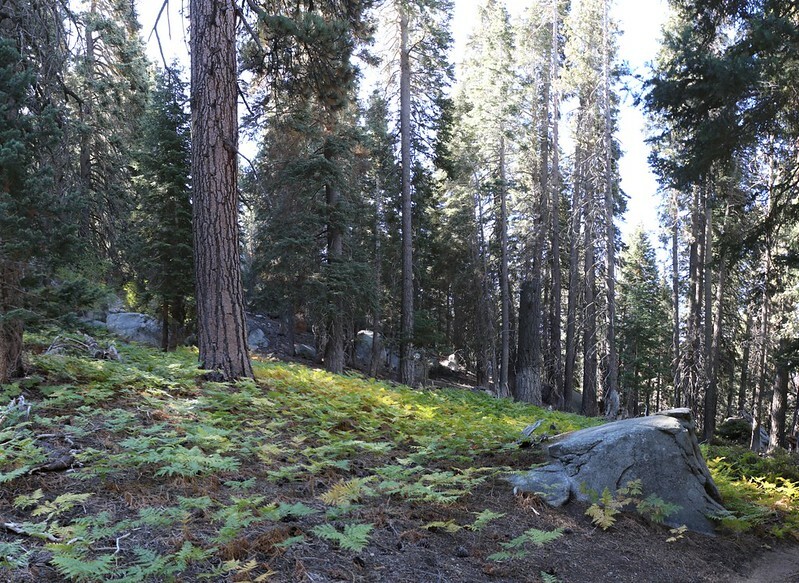 I was getting tired by the time I reached the intersection with the Deer Springs Trail about a quarter mile from the summit. At this point I could have wimped out and headed directly downhill to my tent, but I didn’t. I summoned some extra will power and trudged on up the final 300 feet of climbing to reach the top of the peak. As always, the views were wonderful, although not limitless as there was a bit of haze in the air at lower elevations. There were several small groups of hikers relaxing nearby, and we had fun waving to a sailplane pilot who was swooping and wheeling overhead. He was having a great time riding thermals and updrafts along the mountain ridges. He eventually made a final run for home, heading direct for some airstrip in the distant south. And that’s when I decided to head back home to my tent. I arrived back in camp and I have to admit that I felt quite tired. Maybe it was too much sun, or maybe I had a touch of altitude sickness, but whatever it was I was totally tired-out and not feeling anything like my usual perky self. I climbed into the tent and got dressed in my warm night clothes, then took a nap. When I woke up a short while later I felt a bit better, but not enough to want to eat a full meal. I decided not to bother cooking any dinner. But then I also had a thought that maybe this malaise was due to a lack of some kind, that it might be due to dehydration or hyponatremia or low blood sugar. So I sat up and got out my snacks. I forced myself to drink some dissolved electrolyte solution, and I ate a bunch of salty chips, and I washed it all down with extra water and sweet-tasting Skittles candy. I fell asleep before the sun had even set. I didn’t even get a chance to feel lonely! Once again, the Santa Ana winds kicked up about midnight, and the rest of the night was spent waking up whenever a particularly fierce gust came rolling through. But I was getting used to it now, and I slept well enough that when I woke up around 2 AM I was wide awake. I spent at least an hour reading by headlamp, wondering when the dawn would arrive. If I had brought a more exciting book I would have kept reading longer, but this one put me back to sleep. Boring books can be useful! I woke up at first light and did the same naughty trick with the stove in the vestibule. It worked great, and I had no regrets. After breakfast, I began getting dressed and packing my gear. I discovered the optional storage “loft” I’d purchased for my tent and immediately tried it out. It fit the tent just fine, but I didn’t try it with any weight in its pockets. I had a feeling that it might try to sag down over my face if I stowed too much gear in it, so that when I sat up I’d bonk it with my head or that it would make me feel a tiny bit claustrophobic. If I was intending to set up a base camp for an extended stay this thing might come in handy, but for a one-night-in-each-campsite sort of trek I might never bother to place anything in it and simply leave my gear in a bag on the floor next to me (like I’ve been doing for years). I packed up the rest of my stuff, then tossed it all outside and took down the tent. It was breezy and I wasn’t able to get it to roll up quite as tightly as usual. I’d have to re-roll it when I got back home. But at the moment I only had one thing in mind: To get back home. This “alone with nature” business was all well and good, but it would be nice to be hanging out with Vicki again. Feeling lousy the night before hadn’t exactly enamored me with the solo backpacking lifestyle, but I also realized that feeling lousy doesn’t make anything appear in a positive light. I resolved to give it another try next month. Meanwhile, it was time to get hiking! The air was clear that morning as I took in the views to the west along the way. I still had plenty of water so I didn’t even slow down as I passed the springs and creeks along the way. My strides were long and my breathing was deep and I made excellent time. But there was also a lot of ground to cover. A few hours later I was nearing the end of the trail, where it curves around the north side of Fuller Ridge. 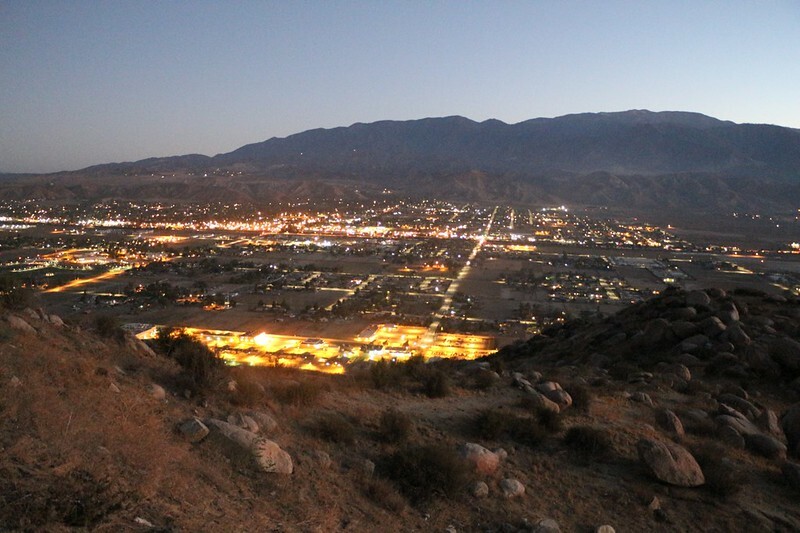 The views are expansive, both out over the desert to the east and directly across the way to San Gorgonio Mountain. 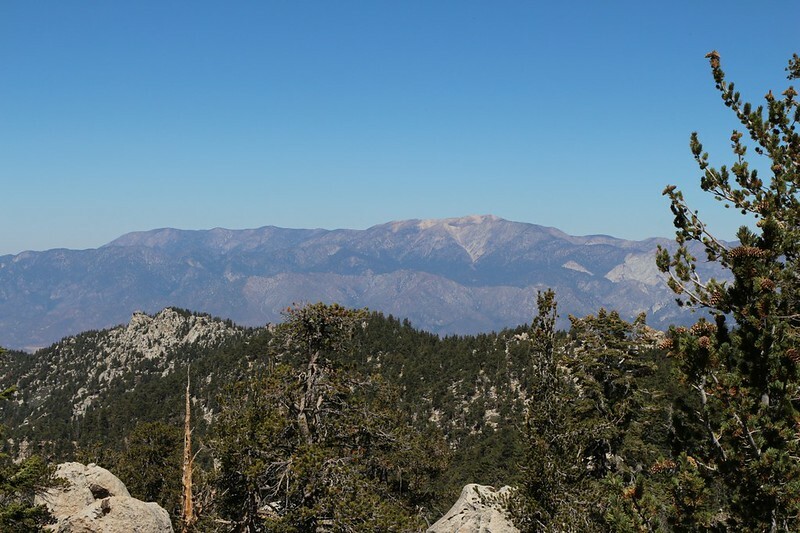 My next hike would be over there on the west end of the range, near San Bernardino Peak. 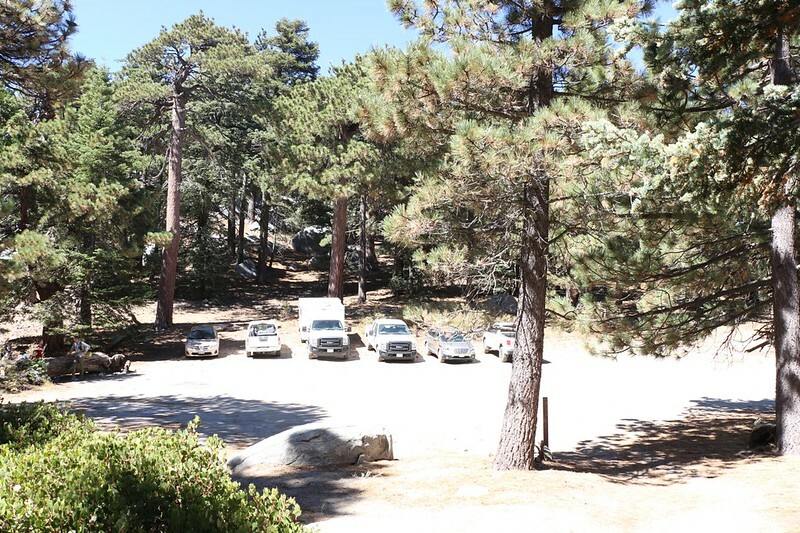 When I got back to the car I met up with a solo PCT hiker, who was taking a break in the shade near my car. He asked about water and I gave him the rest of mine. I also handed him a couple of cans of soda which he promptly drank. We talked about the trail just ahead of him, sixty miles of which Vicki and I had done earlier this year. I also asked him what he thought about hiking solo, but he didn’t have much to say about it. It was a way of life for him, or maybe he didn’t know what he was missing. Eventually, he repacked his pack and I finished stowing mine in the car. I wished him good luck on his travels and he thanked me for the water and soda. And then I drove down that long dirt road toward home. 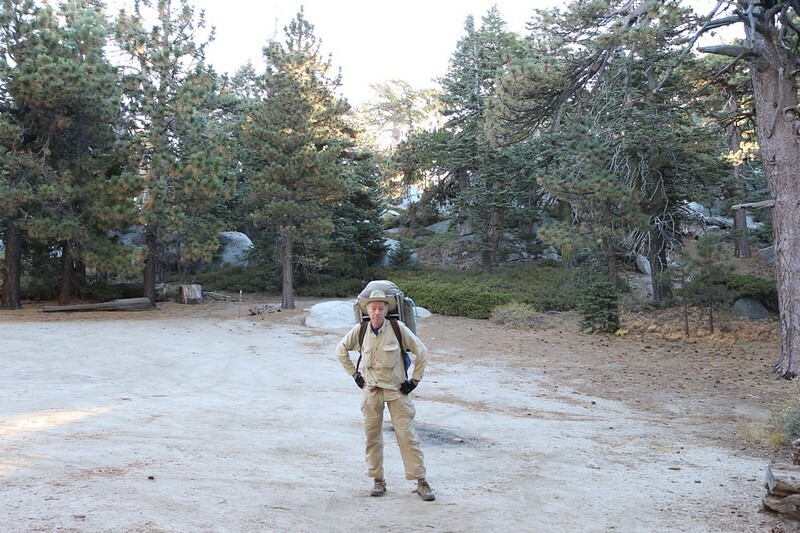 In conclusion, I didn’t form a firm opinion either way about solo backpacking. Was I able to do it? Of course I was. But did I want to keep on doing it in the future? Well, the jury’s still out on that question. We’ll see what happens on my next trip in October.